A pre-winter snowstorm left its mark on the northeast this weekend. Heavy, wet snow fell from Maryland to Maine in record amounts for the month of October. 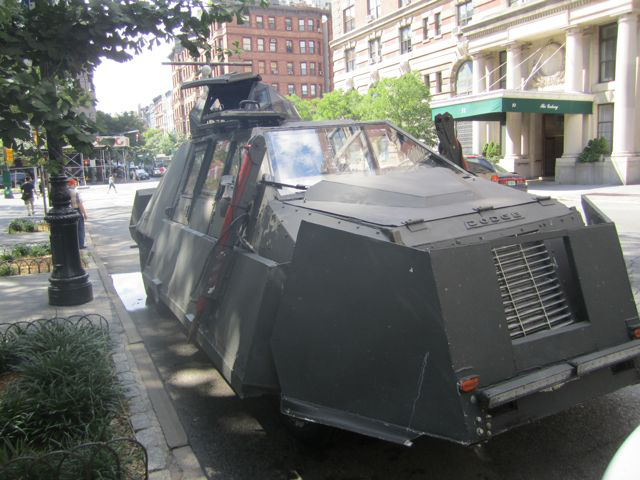 The storm was a classic nor-easter. It moved up the east coast pulling in moisture from the Atlantic Ocean. The area of low pressure also pulled in colder air from the NW producing snow, instead of just rain. In addition, this storm delivered the rare sounds of thunder-snow. In New York City, we set a new record for October snowfall with 2.9 inches in Central Park! 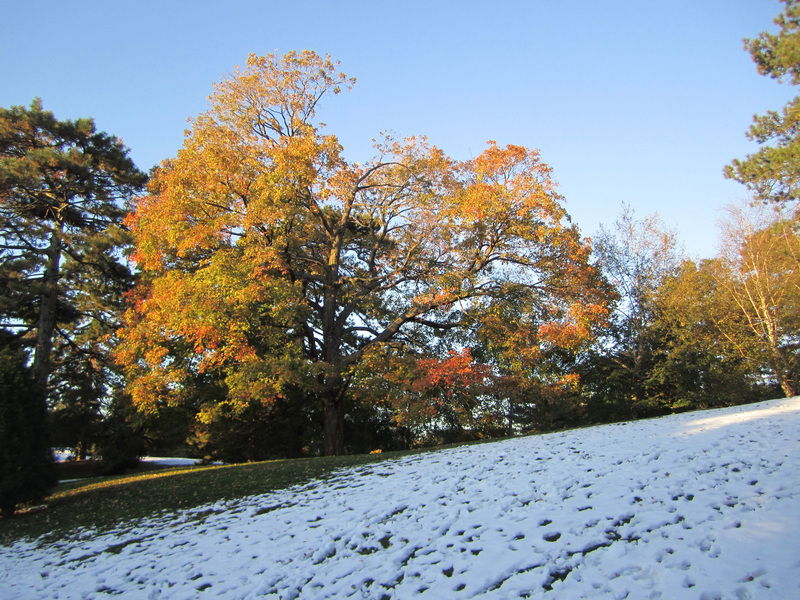 October snowfall here is rare, but not unprecedented. The last time we saw the flakes fly this early was in 2002, but that event did not produce any accumulation. For measurable snowfall (0.1 of an inch or more) in the October, we have to go back to 1952 when 0.5 of an inch fell. The record amount, prior to this weekend, was 0.8 of an inch in 1925. Typically, we do not see measurable snow in NYC until December. The excitement of this early snowfall did not come without a price. Many of the trees in the area still have leaves on their branches. The leaves provide more surface area for the snow to accumulate. The extra weight was too much for some trees and caused many branches to break and fall. In some cases, entire trees were split in two. In Manhattan, Central Park is reported to have lost 1,000 trees in the storm. That is more damage than the park endured from Hurricane Irene this past summer. Downed trees also damaged aboveground power-lines causing outages in many areas. Depending on your point of view, the storm could be seen as Mother Nature’s trick or treat. 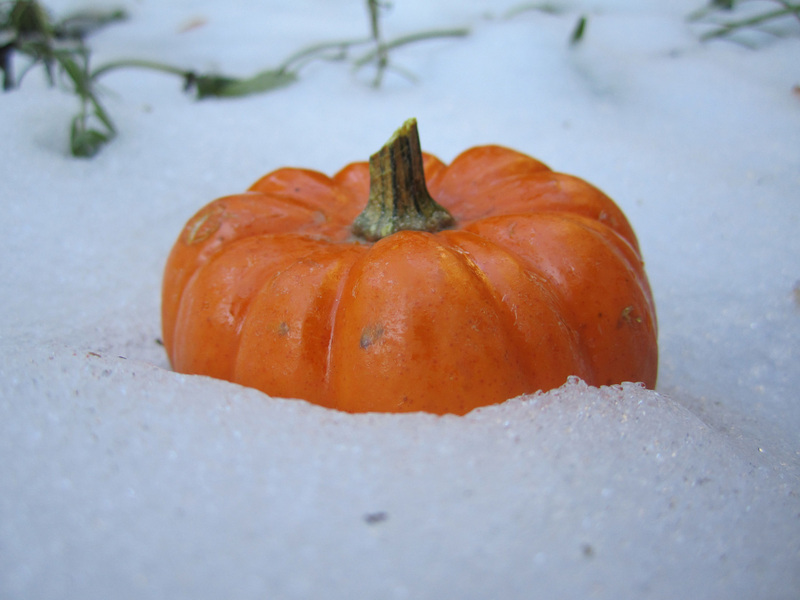 Either way, the residents of the northeast will remember the snowstorm of Halloween weekend for years to come. La Nina has returned for a second year in a row. 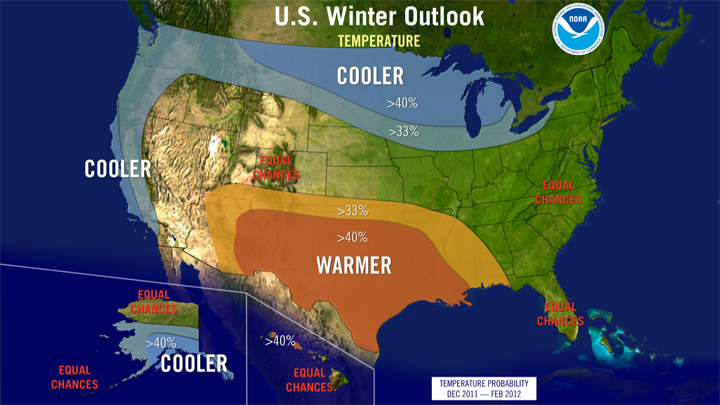 According to NOAA’s winter climate outlook, this oceanic-atmospheric phenomenon will strongly shape our upcoming winter season. La Nina is a climatic episode associated with the larger El Nino-Southern Oscillation (ENSO) climate pattern in the Pacific Ocean. During a La Nina event, sea surface temperatures in the eastern Pacific are cooler than normal. This ocean temperature anomaly influences weather around the globe. 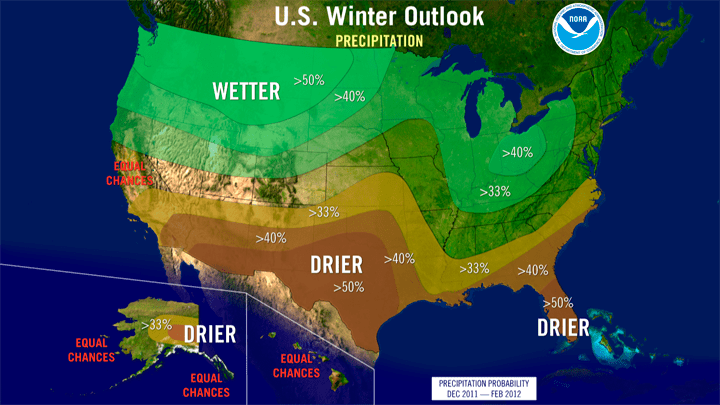 In the US, La Nina will impact both the temperature and precipitation in many parts of the country. The southern states are likely to see conditions that are both warmer and dryer than normal. This is not good news for the drought-stricken state of Texas. The northern tier is expected to experience below average temperatures with the northwest getting above average precipitation. The northeast and mid-Atlantic states have a 50/50 chance of seeing irregular conditions from La Nina. In this region, the Arctic Oscillation (AO), a different oceanic-atmospheric pattern, has a stronger influence on winter weather. Less predictable than La Nina, the AO continually transitions between positive and negative phases. A negative phase will bring cold arctic air and snowy conditions to the eastern US. The cold snaps and heavy snow we saw last winter in the northeast were influenced by a very strong negative phase of the AO. These strong phases can last anywhere from a few days to a few weeks and can be difficult to anticipate in long term forecasts. The current La Nina event is forecast to last through February. On Monday night, the Aurora Borealis, also know as the Northern Lights, made a rare appearance in the lower latitudes of the US. These geomagnetic storms are normally limited to the polar regions, where the earth’s magnetic field is strongest. An aurora is an optical phenomenon that is the result of charged solar particles becoming trapped in the Earth’s magnetic field. These particles ionize or excite the gases that make up our atmosphere. As these gases return to their ground state, they emit light energy that we see as neon-like colors dancing in the sky. The different colors can depend on the amount of energy absorbed, but in general, oxygen tends to produce a green light and nitrogen gives off a red glow. 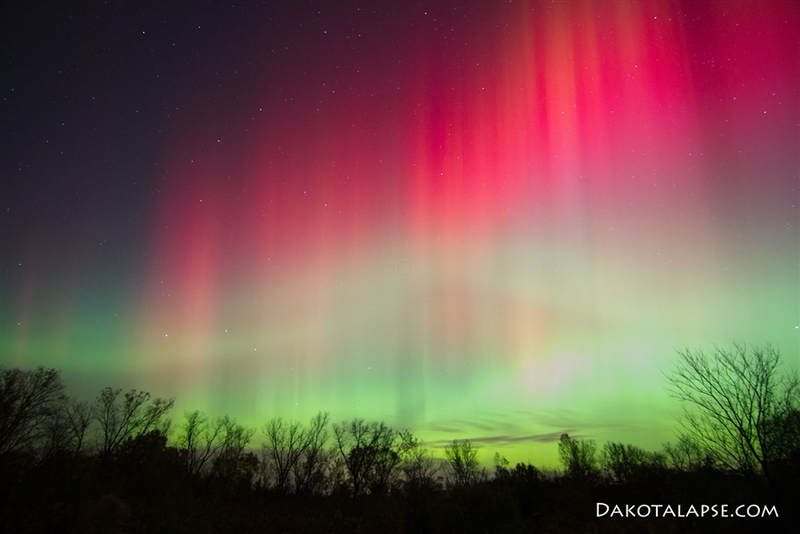 Auroras at the poles are connected to the solar wind, a continuous flow of charged particles outward from the sun. Monday’s unusual display, however, was caused by an intense storm on the surface of the sun and coronal mass ejection. This tremendous eruption of solar wind temporarily allowed the auroral zone in our atmosphere to expand southward. Auroral activity tends to be strongest around the seasonal equinoxes. In the southern hemisphere, auroras are called Southern Lights or Aurora Australis. Clouds are mostly made of water-vapor, but a dash of something extra is needed to complete their formation. As air rises through the atmosphere, it cools. 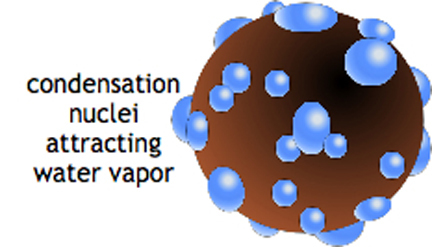 When it reaches its dew point, it is ready to form a cloud if it can find a condensation nuclei. These are free floating microscopic particles in the air, like dust, salt, or smoke . A cloud droplet is born when a water-vapor molecule lands on one of these tiny non-gaseous surfaces and condenses. As cloud droplets gather together in massive numbers, they become visible. There are a variety of potential condensation nuclei in the air. Their size, composition, and capacity to attract and hold water molecules impact their ability to form clouds. Salt particles, for example, are very good at absorbing water while carbon based particles are not. Without the presence of condensation nuclei in the air, cloud development would be limited to areas of significantly colder air temperatures. The daily high temperatures this month seem like they are riding a roller-coaster. While these variations are par for the course in a transitional month like October, they often get people talking about the weather. In listening to some of these conversations, however, I frequently hear the terms “weather” and “climate” confused. 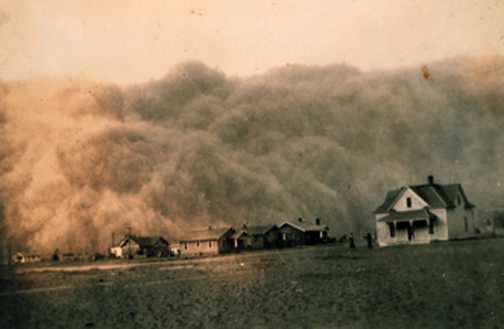 To set the record straight, weather and climate are related, but different. The main difference between the two is time. Weather is the short-term state of the atmosphere at a particular time and place. It references current local conditions like temperature, wind, and precipitation. Driven mainly by the relative differences in temperature and air pressure from one location to the next, weather is constantly changing. Climate is the long-term, ”normal” weather conditions of a given region. It refers to the prevailing weather that we expect for particular seasons based on past experience and tends to be stable for the course of centuries. Over extended periods of geologic time, however, climate does change. For example, our planet has seen the extremes of both ice ages with massive glaciers and warmer periods with higher sea levels. While the Earth’s climate has changed a number of times throughout its long history, the changes happening today are occurring more quickly than they have in the past. Experts say rising global temperatures – the result of increasing greenhouse gases in the atmosphere – are causing weather patterns to shift and, in turn, regional climates to change. The phrase, “to be on cloud nine”, generally means that someone is so elated that they are walking on a cloud. With all the clouds in the sky, why did they choose number nine? I have heard a number of origins for this popular saying, but the one that makes the most sense to me comes from the pioneering days of meteorology. According to this theory, cloud number nine refers to a cumulonimbus cloud … the towering anvil shaped cloud of violent thunderstorms. The story goes back to 1802 when an amateur British meteorologist named Luke Howard developed a basic nomenclature for clouds. He gave us names like cumulus, stratus, and cirrus. His system followed the Linnaean ideas already in use with flora and fauna. As the science of meteorology developed, different nations soon created their own weather vocabularies and classification systems. This lack of consistency was creating confusion, especially since weather does not recognize national boundaries. Before we had radar and satellites, the study of weather and early forecasting relied on cloud identification and communications between weather stations. To function properly and advance the science, these communications needed a uniform system of identification and measurement. In 1896, an International Meteorology Conference was held in Paris to establish a uniform standard of cloud classification. The committee built on Luke Howard’s Latin-based scientific names and set up the convention of grouping clouds according to their altitude. The product of this conference was the The International Cloud Atlas. This reference book used photographs and drawings to identify the ten cloud types agreed upon by the committee. Cumulonimbus was number nine on their list. A cumulonimbus is the tallest of all cloud types. So, to be on cloud nine is to be on the highest cloud in the sky. 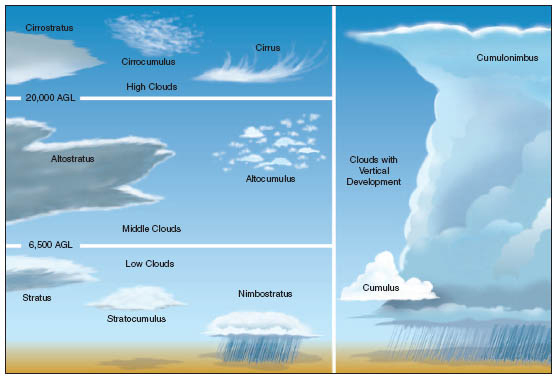 In a later edition of the Cloud Atlas, the order of list was re-arranged and cumulonimbus was moved to number ten. The phrase, however, is still with us. The International Meteorological Committee still exists today in the form of the World Meteorological Organization within the U.N. They continue to publish The International Cloud Atlas. The science behind the color of autumn leaves is a mixture of bio-chemistry and meteorology. Atmospheric conditions trigger a biological process in deciduous trees that cause the leaves to change color. This process allows a tree to protect itself from freezing and survive the winter. Sunlight, groundwater, and temperature all play a part in the annual phenomenon of fall foliage. The main variable that starts the ball rolling, however, is sunlight. As the days grow shorter in autumn, less sunlight is available to power photosynthesis, the chemical process that feeds the tree by converting carbon dioxide and water into glucose and oxygen. The reduced amount of sunlight signals the tree to stop producing food and prepare stores for the winter. 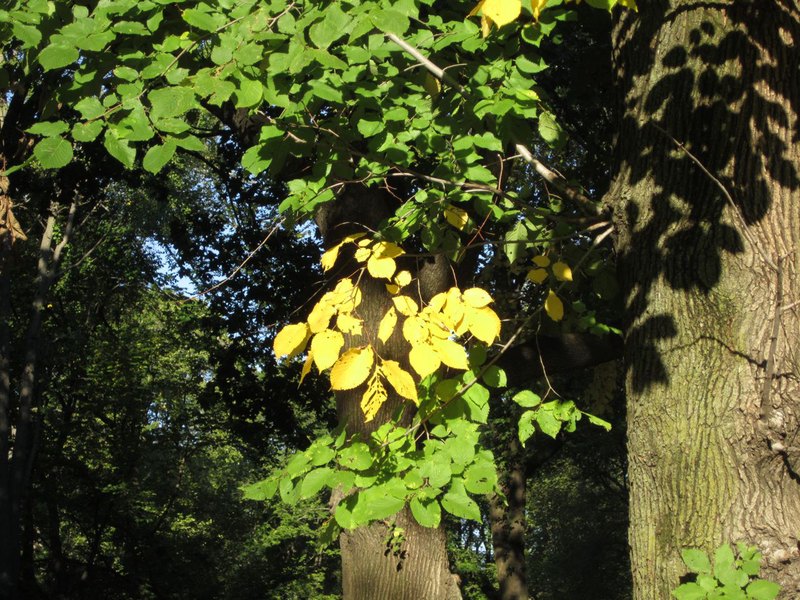 The tree turns off its food producers by slowly corking the connection between leaf-stems and its branches. This blocks the movement of sugars from the leaves to the tree as well as the flow of water from the roots to the leaves. As a result, the leaves stop producing chlorophyll, the agent of photosynthesis and the reason for the green color of summer foliage. As the green fades, other chemicals that have been present in the leaves all along begin to show. These include xanthophyll and carotene that produce yellow and orange leaves, respectively. The change of leaves happens every autumn, but the intensity and duration vary from year to year. This is a result of weather conditions like temperature and rainfall. With below average temperatures, sugars trapped in the leaves react with sunlight and the cooler air to produce anthocyanin. This gives us more red and purplish leaves. Warmer than normal temperatures tend to produce longer displays but with less intense colors. Drought will cause leaves to turn brownish and break off early. It should also be noted that the bio-chemical make-up of different species of trees react to seasonal and atmospheric conditions differently. Therefore, the more diverse the forest, the wider the range of colors in Autumn. This year in the northeast, we have collected all the ingredients needed for a beautiful fall foliage season. Barring any major wind storms that blow the leaves off the trees or an early frost, leaf peeping will be in full swing soon. In New York City the leaves have just started to change, but the color is still a bit patchy. We typically hit peak color sometime around the last week of October.